Monica Maschak - mmaschak@shawmedia.com Jennette Aristud, of Crystal Lake, wraps her hands before participating in the next class at Title Boxing Club on Tuesday, November 27, 2012. The one-hour high-intensity cardio workout classes incorporate boxing techniques. Aristud says she take these classes to get in shape and blow off steam. Monica Maschak - mmaschak@shawmedia.com Ben Skonieczny (left) and Catherine Nunes do a sit-up exercise during a fitness boxing class at Title Boxing Club in Crystal Lake on Tuesday, November 27, 2012. Monica Maschak - mmaschak@shawmedia.com Suzanne Leazzo, of Lake in the Hills, practices jabbing during a high-intensity cardio workout class that incorporates boxing techniques at Title Boxing Club in Crystal Lake on Tuesday, November 27, 2012. Monica Maschak - mmaschak@shawmedia.com Eight-year-old Ethan Paganelis (right) practices jabbing with trainer Jose Alanis while he waits for his mom's boxing class to finish at Title Boxing Club in Crystal Lake on Tuesday, November 27, 2012. Monica Maschak - mmaschak@shawmedia.com Boxing gloves hang on a wall at the Title Boxing Club in Crystal Lake. 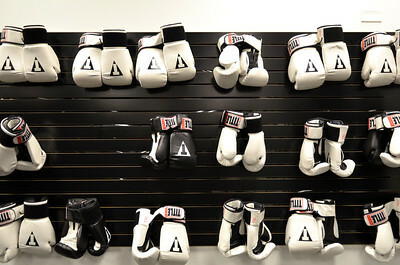 Members use these gloves during classes, which are a mix between cardio and boxing. 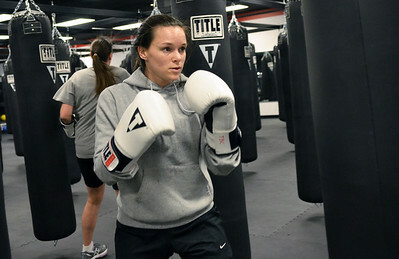 Suzanne Leazzo, of Lake in the Hills, practices jabbing during a high-intensity cardio workout class that incorporates boxing techniques at Title Boxing Club in Crystal Lake on Tuesday, November 27, 2012.